My friend Brit had her second baby a few weeks ago, and he is the cutest, snuggliest little guy! I always forget how tiny newborns are until there’s one right in front of me. I wanted to make a meal for her since I know that cooking is one of the hardest things to find time to do when you have a newborn. 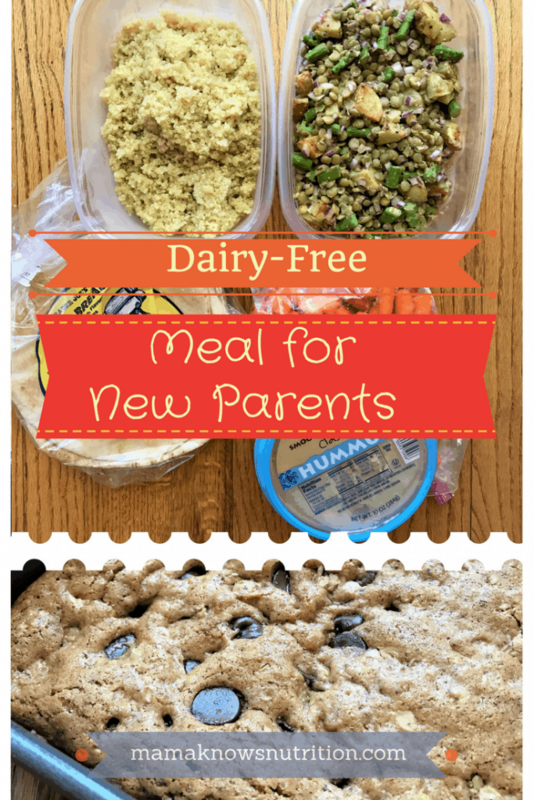 I’m always looking for good ideas of meals to bring to a friend with a new baby, so I thought I’d share what I brought over. Brit already texted asking me for the recipes right after she ate dinner, so I know she loved it! I like to make meals for new parents that can be either quickly reheated or eaten cold. I remember the very first time I brought a friend a meal who had just had a baby. It was about 5 years ago. I knew pretty much nothing about having a baby at this point, but someone sent out an email asking us to bring her meals, so of course I signed up. I roasted some bone-in chicken breasts (so easy by the way) and a mix of potatoes, sweet potatoes, and carrots. My friend texted me later saying that she had eaten everything cold, with her fingers, directly from the pans I brought them over in. And once I had my own baby, I realized that you really do end up standing in front of the fridge grabbing the easiest thing and devouring it before your baby needs you again. I found a delicious looking Roasted Potato and Asparagus Lentil Salad that I knew would be perfect served warm or cold. While I whipped that up, I simmered a giant pot of quinoa so I could bring over a big batch for her and have leftovers to keep at home, too. Since she has a toddler, I also packed up a bag of baby carrots, hummus, and pita to round out the meal. I figured that her toddler would like at least one of those things. Can’t forget about dessert! Honestly, I usually go the store-bought route for a dessert, since it’s just one less thing to worry about. But today I had some time to spare and decided to try these Chocolate Chip Almond Butter Bars from pbfingers.com. The bars aren’t vegan since they do have an egg, but I got the OK from Brit on eggs. You could always sub a flax-egg to keep it vegan. The bars were delicious!! I love that they were a little bit healthier than the typical cookie bar, too. They took no time at all to mix together. I hate having to cream butter and sugar together because it means I need to lug out my Kitchenaid mixer. So, I was glad to find a recipe that was just stir, stir, stir, plop in pan. Teddy taste tested the bars after his nap, he was definitely a fan! Do you have a go-to meal to bring to friends? What’s your favorite vegetarian or vegan recipe? This meal was just perfect Kacie! I’m normally a bit of a dairy addict, so going vegan whilst nursing my baby has not been easy, but this satisfied any cravings I had. Thank you again sweet friend! !